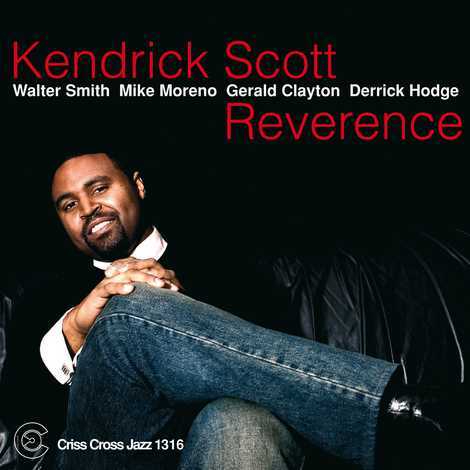 Kendrick Scott, a Houston, Texas native and one of the most sought-after drummers in the jazz world, has distinguished himself for several years with Terence Blanchard's Grammy-winning ensemble. Recently, in the fall of 2008 he toured the world as part of Herbie Hancock's famous band. Kendrick's powerful, illuminating drum work has graced a number of memorable Criss Cross CDs, by Danny Grissett (Promise, Encounters), Walt Weiskopf (Day In Night Out), Mike Moreno (Third Wish) and Lage Lund (Early Songs). So, it's only fitting that Kendrick should now make his Criss Cross leader debut with REVERENCE, a stirring quintet session featuring Mike Moreno on guitar, Blanchard bandmate Derrick Hodge on bass, and the prodigious up-and-comers Walter Smith on tenor and Gerald Clayton on piano. Together, Kendrick and the band put their own stamp on classics by Herbie Hancock, Wayne Shorter, Ornette Coleman and more. They also delve into the Criss Cross archives to interpret Peter Bernstein's Metamorphosis , a swinging, evocative piece from the guitarist's 1998 release Earth Tones.